We’d love your help. Let us know what’s wrong with this preview of The Detective Dog by Julia Donaldson. "There once was a dog with a keen sense of smell. Peter's dog Nell has an amazing sense of smell. Whether it's finding a lost shoe or discovering who did a poo on the new gravel path, her ever-sniffing nose is always hard at work. But Nell has other talents too. Every Monday she goes to school with Peter and listens to chil "There once was a dog with a keen sense of smell. Peter's dog Nell has an amazing sense of smell. Whether it's finding a lost shoe or discovering who did a poo on the new gravel path, her ever-sniffing nose is always hard at work. But Nell has other talents too. Every Monday she goes to school with Peter and listens to children read. So who better to have on hand when they arrive one morning to discover that the school's books have all disappeared! Who could have taken them? And why? There's only one dog for the job... and Detective Dog Nell is ready to sniff out the culprit! 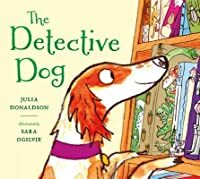 Written by the brilliant Julia Donaldson and stunningly illustrated by the multi-talented illustrator and printmaker Sara Ogilvie, The Detective Dog is a fast-paced celebration of books, reading, libraries, and the relationship between a little boy and his rather special dog. To ask other readers questions about The Detective Dog, please sign up. Another absolute favourite with my children. Great little mystery story for children, with a feel good ending. My son loved the dog and the thought of taking the dog to school has put ideas in his head. There are some Julia Donaldson books that don't work for me (Highway Rat being a good example) but this one does. It's nice to see a fresh illustrator take on Donaldson's work and I think Sara Ogilvie is fantastic. The expressions, movement and graceful shape of the protagonist: Nell the dog. The story celebrates our passion for reading and all the joys that books bring. When the school's library simply vanishes overnight, it is up to Nell to sniff out the perpetrator. The rhyming helps jolly al There are some Julia Donaldson books that don't work for me (Highway Rat being a good example) but this one does. It's nice to see a fresh illustrator take on Donaldson's work and I think Sara Ogilvie is fantastic. The expressions, movement and graceful shape of the protagonist: Nell the dog. The story celebrates our passion for reading and all the joys that books bring. When the school's library simply vanishes overnight, it is up to Nell to sniff out the perpetrator. The rhyming helps jolly along the story but it is the message of the importance of literature and libraries is an excellent one. A cute dog in colorful backdrops, a fun rhyming prose and a mysterious case of missing books make this a really fun and engaging read! 5 stars for this wonderful, fun-to-read-aloud rhyme-y story, 10 stars for detective dog Nell, who saves the day by solving the case AND being the cutest library advocate ever. This is a brand new Julia Donaldson! How exciting! I don't know how well it will do being a hardcover, I find a lot of parents are averse to buying hardcover books for their kids, at least in my shop. This is a brightly illustrated book that left me with a sense of wonder, if any book will inspire the littles to read, it'll be one about a book thief who discovers a library thanks to a book loving detective dog! Loved Sara Ogilvie's illustrations, they just made the story to be honest. This is qui This is a brand new Julia Donaldson! How exciting! I don't know how well it will do being a hardcover, I find a lot of parents are averse to buying hardcover books for their kids, at least in my shop. This is about a dog called 'Nell' that visits a school to read with the children. One thing I like about the book is the pictures take up all the page so readers can really see and imagine what is going on. The book could be good for teaching rhyme, repetition and rhetorical questions as the book uses these a lot. I think the book reflects that dogs don't have to be just a pet, they can be good therapy for children in supporting them. It is something the children can relate to if they have a dog This is about a dog called 'Nell' that visits a school to read with the children. One thing I like about the book is the pictures take up all the page so readers can really see and imagine what is going on. The book could be good for teaching rhyme, repetition and rhetorical questions as the book uses these a lot. I think the book reflects that dogs don't have to be just a pet, they can be good therapy for children in supporting them. It is something the children can relate to if they have a dog at home or like dogs. It also highlights that it is not okay to take belongings without asking and that a library is a really valuable place where children can sit, read and take books out at their own leisure. Tämä hauska runomittaan kirjoitettu tarina kertoo Ella-nimisestä koirasta, joka on etevä etsimään asioita. Ella toimii maanantaisin lukukoirana koulussa, mutta eräänä päivänä kaikki kirjat uuppuvat koulun kirjastosta! On aika laittaa Ellan etevä etsijänenä toimimaan ja seurata johtolankoja. Hauska kirja, jossa oli mielestäni oikein onnistunutta riimittelyä. Kirjan lukeminen ääneen oli vaivatonta, eikä lukemisen jaksotusta tarvinnut pysähtyä miettimään. Aukeamilla oli paljon erilaista katsottavaa Tämä hauska runomittaan kirjoitettu tarina kertoo Ella-nimisestä koirasta, joka on etevä etsimään asioita. Ella toimii maanantaisin lukukoirana koulussa, mutta eräänä päivänä kaikki kirjat uuppuvat koulun kirjastosta! On aika laittaa Ellan etevä etsijänenä toimimaan ja seurata johtolankoja. I read this book with Year 1 and they loved it. It is a great book for book discussion as there are so many questions to ask! Who do you think the thief is? What does the thief look like? What do you think is behind the door? They were all really engaged with the story and came up with some fantastic ideas as we went along! A repetitive book full of continuous phrases which may encourage the children to join in with the book. The illustrations are clever because they are simple with the smell linking in the air; showing the children how Nell is the detective trying to find the smell of the thief. Cute reading therapy dog who's also a detective!? Loved this one. Good book. Read it to the class at the end of the school day - children really enjoyed thus as a way to wind down after learning and before going home. So this book is frickin' adorable--art and story. Probably my new favourite Julia Donaldson book. It's about sniffing books and libraries. Two of my very favourite things ever. Amazeballs. Julia Donaldson books are a perennial favourite and I think this new one will quickly be on the list of must haves. Peter's dog Nell has a keen sense of smell and she is out solving crime all of the time! Mondays are a special day for Peter and Nell, they go to school and Nell listens to the children read but one Monday when they arrive at school all the books have been stolen! Detective dog Nell is on the case! 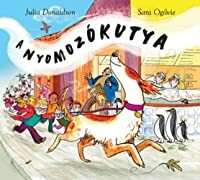 This is a fast paced story celebrating the amazing sense smell dogs have and the joy Julia Donaldson books are a perennial favourite and I think this new one will quickly be on the list of must haves. Peter's dog Nell has a keen sense of smell and she is out solving crime all of the time! This is a fast paced story celebrating the amazing sense smell dogs have and the joy of books - how could I not like it? Wouldn't it be dreadful?! - arriving at the school library to find all the books have been stolen! But happily, Peter has been taking his dog Nell to the library with him, and Nell not only loves books but is a great tracking dog with a keen sense of smell. This is the latest in Julia Donaldson's extensive list of published books. She rhymes so nicely, the stories are nice, and the illustrations are beautifully suited. This, like any of her others that I've looked at with the grandchildren, is a Wouldn't it be dreadful?! - arriving at the school library to find all the books have been stolen! But happily, Peter has been taking his dog Nell to the library with him, and Nell not only loves books but is a great tracking dog with a keen sense of smell. An adorable children's book. An excellent read to share with the family! This Review is by my 8 year old sister! This Review is also up on my Blog - in English and German. It’s about the dog Nell who can smell very well. Nell likes so smell books the best, that’s why she smells on Monday in the romper room immediately that something is wrong: The book are gone! Who stole the books? Nell will find out! I liked the rhy This Review is by my 8 year old sister! I liked the rhymes; those made the book a little funny, because it doesn’t sound like a normal story. I liked how Nell followed the trail and that you could follow their way in the book. And the pictures are super, great, fantastic! The story showed me that you should asked first before you borrow something and that even if you do something bad you can learn something from it. The book if great for children who like dogs and detective stories. Nell is not only a book for little good noses, but also perfect for booklovers! While reading my sister called out immediately that Nell is like me, when it was written that Nell’s favorite smell are books. Because, let’s be honest, what smells better than books? For more there is nothing more beautiful than the smell of adventures and dreams. Because of the rhymes in the book it was great fun reading it and my sister was captivated. On every page there is much to discover in the illustrations, but because of the dim print it was no stimulus satiation. The story is sweet and even makes one think. But what else would you expect from the author of the Gruffalo? -Sometimes it doesn’t rhyme perfectly, which makes you stumble when reading. But it might be only in the translation. +Sweet stories that also teaches you something. +Much going on in a short time. Note: Thanks to orell füssli for sending us the review copy! One Monday, Nell's sensitive sniffer detects a problem. 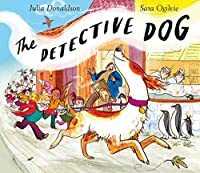 Racing inside, she and Peter discover that all of th The Detective Dog by Julia Donaldson follows one super sleuth canine on a mission to solve a most puzzling mystery. Detective Dog Nell loves solving crimes. But that's just what she does Tuesday through Sunday. One Monday, Nell's sensitive sniffer detects a problem. Racing inside, she and Peter discover that all of the books have been stolen. Will the dynamic duo be able to find the clues and recover the stolen property? I greatly enjoyed reading this book. I love the idea of a mystery solving canine that uses its nose to snuff out crime. Donaldson's characters are smart and lovable. Nell's larger than life personality definitely tickles my funny bone. I wasn't expecting for the text to be in rhyme, but it adds a fun musicality to the mystery. I also love that Donaldson includes children reading to Nell as part of the story. As a certified therapy dog handler, this is a program that is close to my heart. I hope that more schools will open their doors to therapy dog teams as the benefits of children reading to dogs is truly monumental. Sara Ogilvie's illustrations are amazing. Her style appears to be ink with watercolor. Each image pops off of the page and will certainly delight young and old readers alike. I love how expressive she made Nell's ears. My favorite illustration is the vignette of a boy reading a book about knights to Nell. 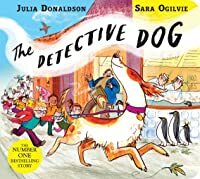 The detective dog is a book by Julia Donaldson MBE, the same author of the very popular children's book 'The Gruffalo'. The book has a simple, friendly and fun story, told in rhyming couplet sentences. It is about a dog who has a gift for solving mysteries i.e finding lost items. She loves the smell of books, so when the children's books go missing, she uses her nose to take them all on a quest to find them. This book is great for children ages 3-8 years old. Younger children would need to be gu The detective dog is a book by Julia Donaldson MBE, the same author of the very popular children's book 'The Gruffalo'. The book has a simple, friendly and fun story, told in rhyming couplet sentences. It is about a dog who has a gift for solving mysteries i.e finding lost items. She loves the smell of books, so when the children's books go missing, she uses her nose to take them all on a quest to find them. This book is great for children ages 3-8 years old. Younger children would need to be guided by an adult and either be read to or read with but the colourful and detailed pictures on each page can also help them to follow along and understand the story. However, the book has some more advanced vocabulary to challenge older children aged 7-8, i.e meteorites, plasticine, astonishing and undergrowth. The book can be used in the classroom as a nice wind down story for younger children at the end of a busy day. It could also be used to help older children with their poetry skills and can demonstrate how a story could be told in this style, children could use this a basis for writing their own rhyming stories. I've just gotten teary-eyed reading about a little dog in a children's book. Don't worry though. She doesn't die nor does anything bad happen to Nell - the dog who detects. But the story is so beautifully told. That it made me get all damn choked up. It's a beautiful story about a smart and studious dog who lives with a boy named Peter and is superb at sniffing out smells. 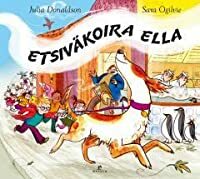 She's also very calm and conscientious, so every Monday she accompanies Peter to his school, I've just gotten teary-eyed reading about a little dog in a children's book. It's a beautiful story about a smart and studious dog who lives with a boy named Peter and is superb at sniffing out smells. She's also very calm and conscientious, so every Monday she accompanies Peter to his school, where his fellow classmates read to her. The school library is her favorite place, because her favorite smell are books. This is such a lovely book. Then why are you still reading this review?? This is by far my daughter's most favourite book. She is 17 months old and insists I read this book at least twice a day. It is a fun story though, with lovely illustrations, clever rhyming and a jauty adventure to join along with. I love a good rhyme, plus there's plenty of opportunities for word learning as Nell the Detective finds and smells many different things on the journey. Do I wish I didn't have to read this book everyday? well, yes. Is there another book I would prefer to have to read This is by far my daughter's most favourite book. She is 17 months old and insists I read this book at least twice a day. It is a fun story though, with lovely illustrations, clever rhyming and a jauty adventure to join along with. I love a good rhyme, plus there's plenty of opportunities for word learning as Nell the Detective finds and smells many different things on the journey. We loved this fresh Julia Donaldson story. In this story Nell, a dog with a great sense of smell has to go on the hunt to find who has stolen all the books in the classroom. It is a beautifully written rhyming book children will love to hear read out loud. Paired with illustrator Sara Ogilvie on this one, instead of the usual Axel Scheffler, makes room for a fresh take on the story. Ogilvie's illustrations have more details and my son loved studying the illustrations for hours to take it all in. I usually enjoy Julia Donaldson's books and I expected to love this one, especially since it's about libraries and I'm a librarian. Unfortunately it didn't hook me in quite the same was as some of Donaldson's other works (A Gold Star for Zog). I still enjoyed it, and it has a great message, but it just wasn't my favorite. Nell is a dog who is great at solving mysteries - she finds lost things all the time! So, when the classroom library is stolen (yes, every book is gone) Nell is on the case following the trail and finding the culprit. Cross posted to Nell is a dog who is great at solving mysteries - she finds lost things all the time! So, when the classroom library is stolen (yes, every book is gone) Nell is on the case following the trail and finding the culprit.